-> Consists of amazing nibbles (half of which I have absolutely NO idea of, but nevertheless, yummy, and I hope, SAFE TO EAT). LOL. 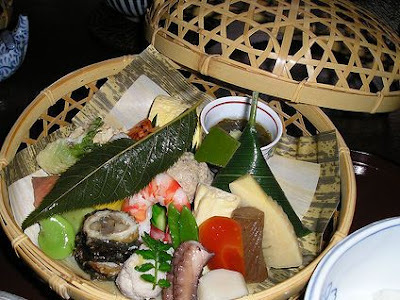 I especially loved the kamaboko-wrapped taro and the sweet bamboo shoots. This restaurant was to be closed the next day for relocation, so I was one of their last customers in the old location. I loved this restaurant, it was the first Japanese restaurant I've been in Hong Kong (I first visited it in 1991! ).